We’ve now released the full programme for our conference ‘Exploring the Social and Cultural Contexts of Historic Writing Systems’, which takes place in the Faculty of Classics, University of Cambridge on the 14th-16th March 2019. It can be viewed and downloaded on the Conference page. We are also now opening registration. The conference is free but if you’d like to attend it is necessary to register, as places are limited. To do so, please email Dr Philip Boyes at pjb70@cam.ac.uk. We look forward to March and what is shaping up to be a fascinating set of talks! 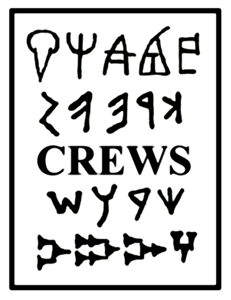 Announcing the new CREWS Visiting Fellows! The CREWS Project has recently welcomed Sarah Lewis to the team, as our Project Assistant and Administrator. Sarah joins us from Regent’s University London, where she was a Data and Research Officer, and is excited to be part of the CREWS Project Team as it has many links to her broader interest in languages, sociolinguistics and language development. Sarah gained an MA (Hons) in Applied Linguistics from the University of Sheffield in 2006, where she particularly focussed on language development and the social context of language use in L1 and L2 learners. It is lovely to have the whole team together and we are all looking forward to a new academic year full of interesting new research and outreach activities – keep an eye on the blog for more news on these soon.